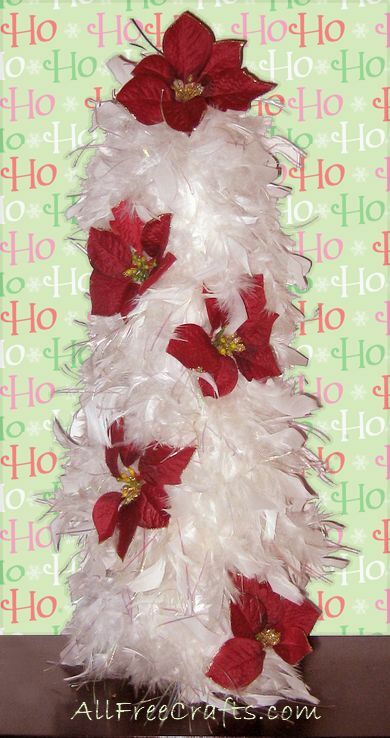 You can make this feather boa Christmas tree very quickly, using inexpensive supplies, and it really looks stunning studded with poinsettia blooms. This is a very simple Christmas craft with surprisingly effective results. Obviously, the size and shape of your finished feather boa tree will be determined by the type of cone that you use as a base. You can make your own cone shape from poster board, or bristol board, or use a prefabricated styrofoam or cardboard base. There is a good tutorial on making Christmas tree cone forms from poster board on TheHappyHousie.com. The feather boa tree that I made used a poster board base made in a very similar way. Glue one end of the feather boa at the top of the cone form. Begin winding the feather boa around the cone in a downward spiral, making sure that none of the poster board is visible through the feathers as you proceed. Apply glue where necessary to keep the boa where you want it. I used two poinsettias picks that had multiple blooms. I simply removed all the blooms and applied each of them to the feather boa tree with a bit of hot glue. Start with one poinsettia bloom secured at the top front of your tree. Proceed downwards, moving the tree around as you glue down each of the poinsettias. Keep the blooms as equally spaced as you can while moving steadily down.